Special Containment Procedures: The shaft leading to SCP-3220 has been filled with concrete. No further exploration or investigation into SCP-3220 is permitted at this time. Description: SCP-3220 is a large underground silo located underneath an abandoned warehouse on Hashima Island, Japan. It is accessible by way of a fifty-meter deep shaft under a hatch in the middle of the warehouse floor. A small metal placard bearing the words ”Department of Abnormalities” in Japanese is bolted to the hatch. SCP-3220 extends just over one kilometer into the ground and is twenty meters in diameter. The structure is designed in a manner similar to a panopticon1. It possesses two hundred floors, each of which is five meters tall and consists of a circular balcony, three meters wide, that runs the circumference of the room. A large tower in the center of the structure extends from the bottom floor to the height of the top floor; it is constructed of opaque, one-way glass reinforced by a steel frame. No method of access into the tower has been found. Each floor of SCP-3220 contains cubic cells recessed into the walls; these cells are three meters to a side and are fully exposed to the rest of the structure. A semi-translucent panel in the back of each cell provides light. There is a drainage grate in the center of each cell; it is unknown where these grates drain to. All but one of the cells in SCP-3220 are occupied by a single humanoid sculpture made of painted concrete. All sculptures are located directly above the drainage grates in their cells and oriented to face the tower. Each sculpture constantly secretes an unknown dark red substance which drains into the grates. 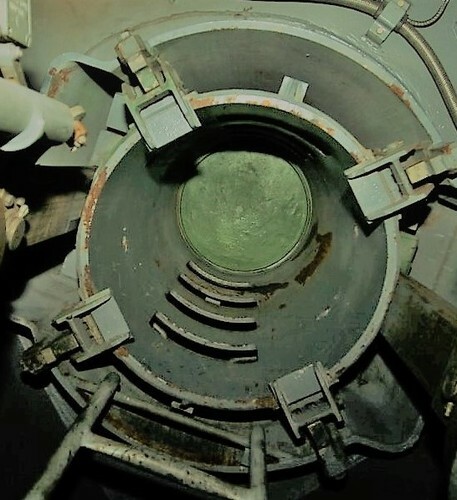 Addendum: Prior to SCP-3220 being sealed with concrete, a hatch was located on the bottom floor of the structure, which provided access to the tower’s viewing room via a ladder. Inside the viewing room was a single human skeleton with a broken neck. 1. A type of institutional building that is designed in such a way that all persons inside the building can be observed by a single watchman, but themselves are unable to see the watchman or even determine if they are being watched at any given time.